It has now been 6 years that no new Humayun Ahmed book has come out during Amar Ekushey Boi Mela. But the works left behind by the legendary writer still resonate strongly with book-lovers and visitors at the fair. 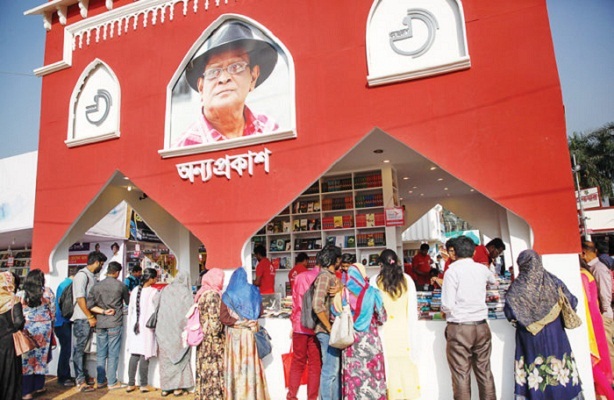 This is the sixth Amar Ekushey Book Fair after the death of legendary writer Humayun Ahmed, who had passed away at a New York hospital on July 19, 2012. Everyday thousands of book lovers specially the young generation are visiting and buying the books of popular Bengali fiction writer. And so, the sales of Humayun's books are increasing day by day. A huge number of book lovers are showing and buying books of Humayun at the stalls of Anyaprokash, Anupom Prokashani, Oboshor Prokashani, Mawla Brothers, Shomoy Prokashani Kakoli Prokashani, Ananya Prokashani and Annesha Prokashani. Humayun Ahmed wrote more than 200 novels besides science fictions, travel and children books. The publishers and executives of houses that brought out his books in Ekushey Boi Mela, said this year Humayun Ahmed’s novels Shonkhonil Karagar, Dewal, Jyotsna and Jononir Golpo, Badsha Namdar, Daruchini Dwip, Nirbason, 'Omanush Moddhaha, Himur Dosh, Humayun Rachanabali, Badal Diner Ditio Kadam Ful, Misir Ali are selling most. "Humayun Ahmed dominated the literary field for 30 years. His literature is a timeless chapter in the history of Bangladesh. Now he is no more physically but his books dominated the book fair even after his death at last 6 years,” he added. “All classes’ people specially the youth are more interested about his works. Dewal, Humayun Rachanabali, Jyotsna and Jononir Golpo are selling most,” he added. "Humayun Ahmed books always attract me. He tried to use simple and easy word in his works. It is difficult to leave his books once you start reading. It is just like music. I bought two books named, Badsha Namdar and Misir Ali. It is our bad luck that we lost him,” said Mehjabin Alam , an officer of a private bank who came to the fair with her family.